AROUND the back streets in one of Shepparton's industrial precincts sits a neat, tree-fronted building with a "temporary” sign proclaiming it to be the home of Kyzer Kustoms. Although in the building for some 18 months, Kyzer Kustoms owners Luke and Sheree McIntosh have been under the pump to the point where they have not had time to erect something more permanent. Leaving school, Luke did a TAFE course in motorsport and then went to Brad Jones Racing in Albury as a fabricator, also doing the tyres at race meets. A year-and-a-half later he got homesick, and returned to Shepparton where he picked up work driving for Frank Gattuso Transport, eventually doing interstate. Along the way he suggested that he could "trick” up a couple of Frank's trucks. "It started off with louvre grills on a couple of his Western Stars,” he said. 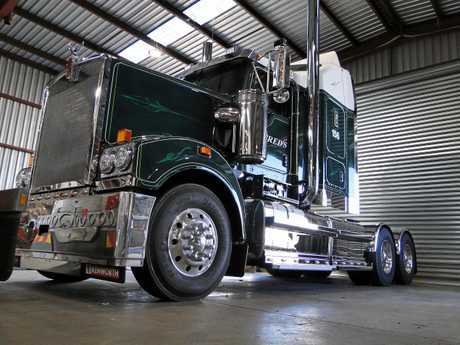 "Eventually we did a whole truck for the Alexandra Truck Show some five years ago. That was a K104 which we did it in collaboration with Shep Motor Panel and it won the age group it was in. "It snowballed from there. We started advertising the 104 on eBay as a package kit. "Mark Tobin Transport in Brisbane saw it and liked it. For his first truck we sent the bits and pieces up to Brisbane for him to fit. Eventually we did a brand new K200 for him. The business doesn't stop with just fabrication. "We can organise full paint jobs and scroll work. We are effectively a full in-house shop for anyone who may want to trick up their truck from metalwork, paint, scrolling, lights, to wheels,” he said. 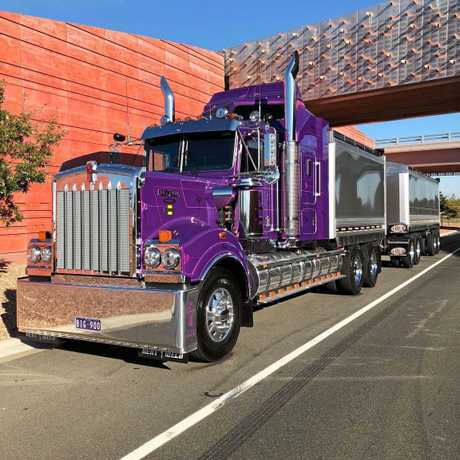 Franca Gattuso's trucks are regularly winning awards at truck shows around Victoria, a reflection of the work that Luke and his team at Kyzer Kustoms put in. In the short time Luke has been in business, he has put his mark in some way or another on 2000 trucks. It's a big step for a young couple to risk everything and step out into business on their own. Sheree said that's why they started off in a garage to see how Luke would go. "He did really good work and keeps getting more and more. That was word-of-mouth back then,” she said. Where does Kyzer come from? "We heard the name Kyzer many years ago on a TV show,” Sheree said. "We liked it and kept it in the back of our minds. Then when we started the company we needed a name. The couple invested in a laser cutter in the last 12 months. In "the shed” at the moment is a 1987 SAR with an 892 V8 belonging to the Cricelli family at Lancaster. It only has 147,000km on the clock! The paintwork is original and in as-new condition but the family decided it could do with a bit of tricking up. At the back of the factory is a nice T909 belonging to Fred's Transport. The T909 is one of two (the twins as Fred calls them) that Kyzer's are working on. "We've modified the front bumper by putting a lip on the bottom, added a swing plate and mudflaps,” Luke said. "We've done the lights under the grill, put a swan on the bonnet, and changed the grill mesh. There's a stainless visor. "It's got Vortex air cleaners on it with air cleaner pipe covers. It's got mirror lights, seven-inch monster stacks and stainless wings. It's got stainless guards the tanks have all been wrapped with hundred mill stainless straps and we have done stainless steel steps. "There's a stainless battery box to go on it as well. At 31 years young, Luke's expertise is, well, frankly amazing. Kyzer Kustoms can be found at 49 Drummond Road, Shepparton, Victoria. Phone 0403130149.